Comprised of energetic gifts from immortal yogis, Siddha Medicine amplifies the awakening to deeper conscious levels of beingness in a body. A Maha Siddha is one who has dissolved the distinctions between the physical body and the soul. When this happens time and distance dissolve, enabling him/her to come and go with either a physical body or a light body! Maha Siddhas all love us and leave us teachings, clues and sometimes psychic guidance to help us on our path to fulfill our life purpose! Siddha Medicines come to us endowed with their blessings from the energetic sites where they dissolved into light, and they benefit collaborative heartfelt seekers striving to follow the Maha Siddha example. 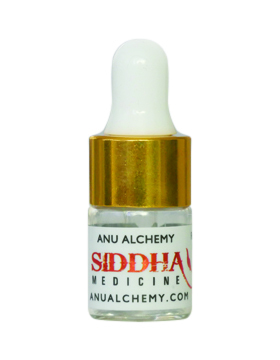 Siddha Medicines spark an awakening to extra-dimensional savvy, a more profound intuitive knowing. And they impart an inner experiential understanding with the clarity coming from beyond mental processes! Taken with prayer and meditation these energetic tools exponentially deepen and enrich the exploration of our inner worlds! For external use only: Apply a tiny amount of this oil to your forehead, third eye, throat or heart chakra before meditation.